If you read my post at Beautifully Rooted yesterday, you found out a little secret about me. For those of you that didn't catch it, I don't like pumpkin. I don't want pumpkin in my pie, cookies, coffee, cream, cupcakes, donuts, bread or - and I might cause the internets to crash on this one - my latte. I'm sure I lost of few friends on that last one but seriously, folks, I just don't care for it. 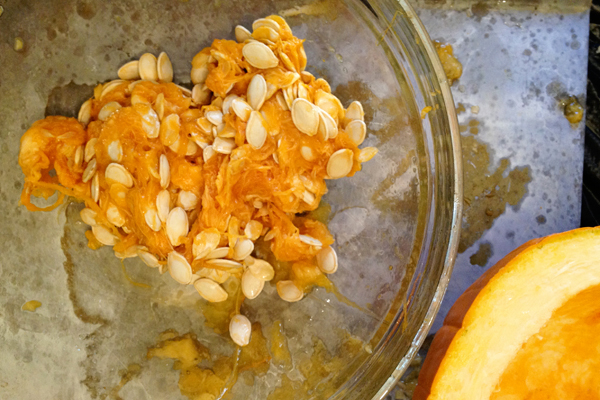 More power to all you pumpkin lovers out there! You don't have to worry about me cutting down your beloved PSL supply at sbux. I'll stick to my trusted plain jane, vanilla latte. Now that I've lost some of you completely! 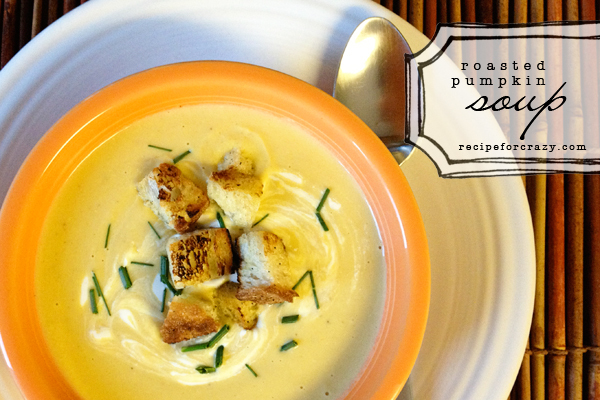 I will say that I love, love, love pumpkin soup. I think it has to be the savory side of it that gets me. So, this year while the husband and oldest daughter were carving on their pumpkins, I took a knife to mine to prepare homemade soup. 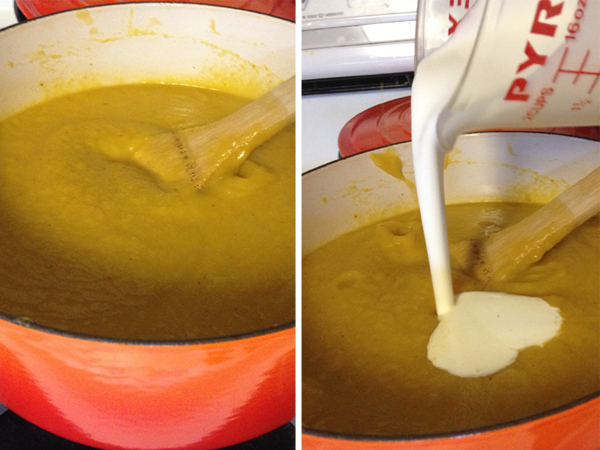 This was my first time making pumpkin soup and I knew I wanted a soup without a lot of frills so we could really taste the pumpkin and I wanted it creamy. I found these two recipes and kind of did my own take on them, this one from my pal Martha and this one found on easy peasy food. I'll stop blabbing and tell you how I made it. 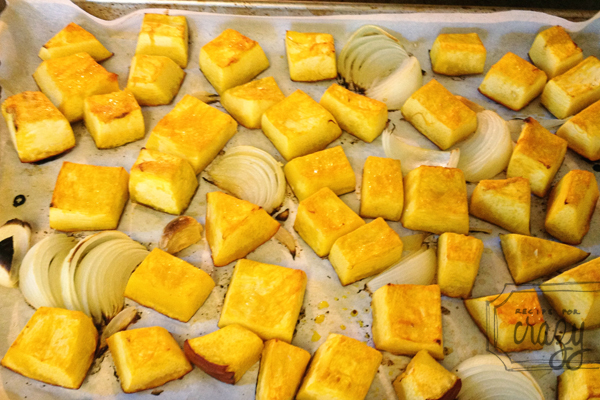 croutons - made from crusty, rustic bread which is also good for dipping! Cut a small pumpkin in half. 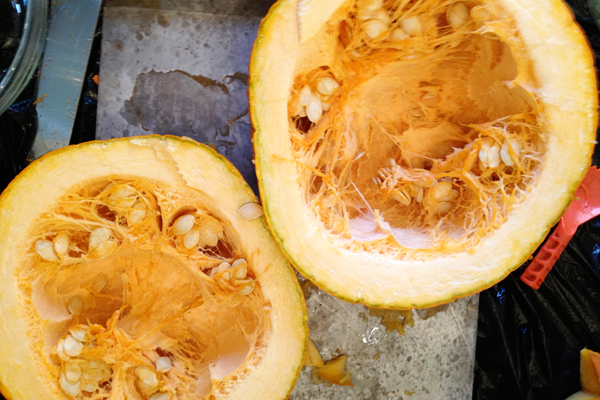 Scoop out the seeds and chop it into smaller chunks. 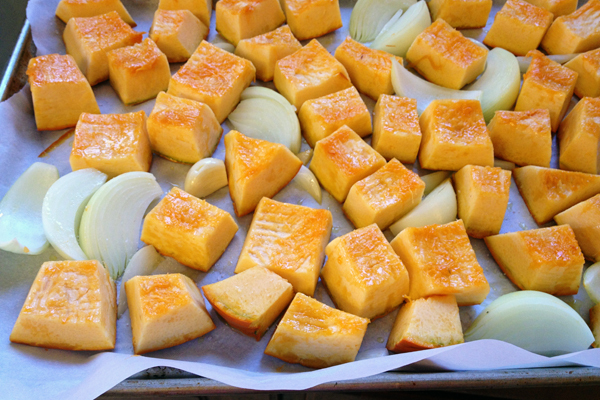 Lay the chopped pumpkin pieces on a cookie sheet lined with parchment paper, add the garlic and onion wedges and toss with about 1-2 tablespoons extra virgin olive oil. Then season with salt and pepper and roast in the oven at 450 degrees for about 30 minutes, or until tender and the onions start to brown. 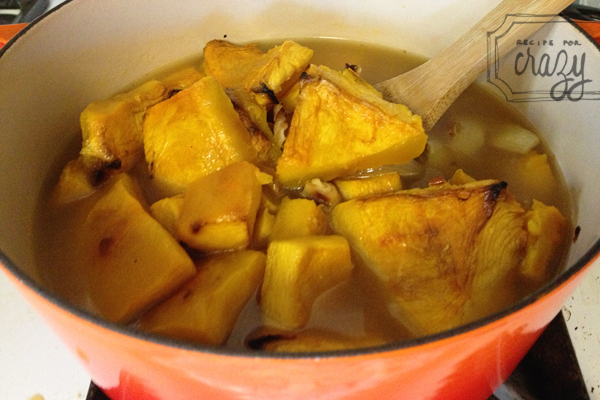 Trim the peel of the pumpkin and transfer everything to a large pot and add the chicken stock. Bring it to a boil then reduce the heat until it's simmering and let it simmer for about 10 minutes. If you have one of those fancy immersion blenders, stick it in there and blend it all until it's nice and smooth. If you don't, like me, transfer it into a blender and blend until smooth and return to the pot. I had to do several batches to get it all. Then add the cream, stir and serve. 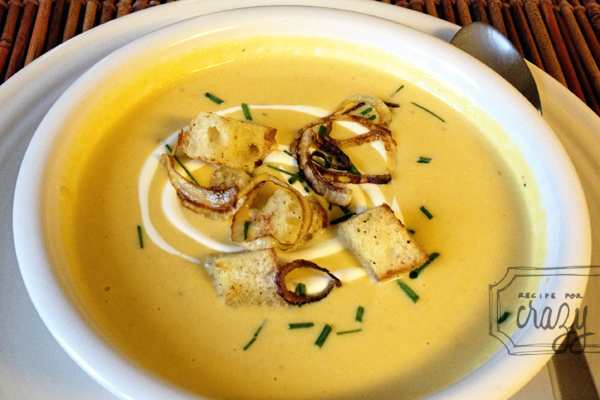 We served ours with fresh croutons, fried onions and chives on top, which I highly recommend. I only wish I made more croutons. So much better than just dipping your bread! 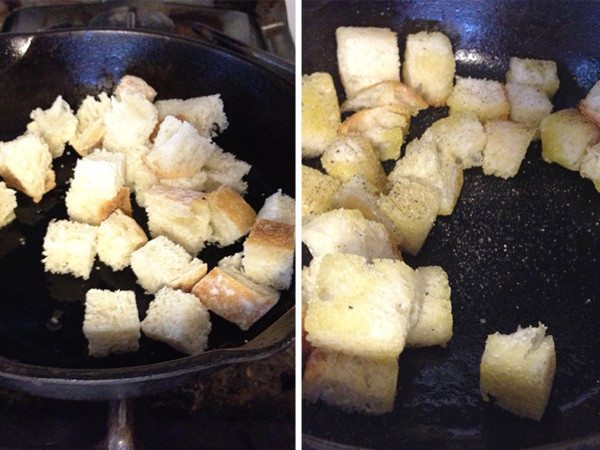 If you want to make some croutons, it's super easy, just cut some fresh, rustic bread into large cubes. Heat a little evoo in a skillet on medium and add the bread. I actually fried some sliced onions first and just added a little more oil. Anyway, toss the bread around to coat and season with salt and pepper. Stir every now and then so the bread doesn't burn but gets nice and toasty. Then top your soup! lesley. i hate pumpkin too. something else we have in common. i can't handle it. the only thing i'll eat is pumkin bread. with chocolate, obviously.